Dean, Keith, Silvio, Harry, Phil and I were in attendance for our last meeting of 2017. I kicked the meeting off by describing how Carol and I had watched the ISS flyover the previous night around 5:15 PM while we were walking the Prairie Path. Just as the ISS pasted the zenith, we saw another satellite cross behind it. Since I had my Iphone with me, I checked the “Sky Guide” app to see what it was. To my surprise, it was the Tiangong1 Chinese space station. I knew it wasn’t occupied anymore because China had already launched a second space station, Tiangong2, in 2016. With a little more research I discovered that Tiangong1 had been unoccupied since June 2013 and that the Chinese had lost control of it on March 20, 2016. It is destined to re-enter the atmosphere sometime in Jan/Feb of 2018. Since it occasionally passes over Chicago, it could be quite a sight to see it burn up. Hopefully, I won’t find a hunk of titanium in my back yard. I also discussed a couple of books I’ve read. The first book, MASS by Jim Baggott, had the interesting fact that the 3 quarks that make up the proton only account for 1% of the mass of the proton. The other 99% of the mass comes from the energy of the strong force that binds quarks together. The binding force comes from a particle called the gluon. You can think of the quarks as being attached to rubber bands and as you try to pull the quarks apart, you have to keep adding more and more energy. You eventually put in so much energy that additional quarks are created. At least in the current universe, you never find singular quarks existing. A proton weighs 1.6727 x 10^-27 kg or 938 MeV (million electron volts). The proton consists of 2 “up” quarks and 1 “down” quark. An up quark weighs 2.3 MeV and a down weighs 4.8 MeV. A neutron consists of 2 “down” quarks and 1 “up” quark. Another interesting fact from the book is that an object traveling at 86.6% the speed of light will have its mass doubled. This increase of mass with speed is why a particle with mass will never travel at the speed of light because it would take infinite energy to get it going that fast. The second book was “The Little Book of Black Holes” by Steven Gubser and Frans Pretorius. This book had the interesting fact that a non-rotating black hole is only 6% efficient in converting accreting mass into released energy but a rotating one (a Kerr Black Hole) can be up to 42% efficient. Uranium fission is only .1% efficient in converting mass into energy and hydrogen fusion is only .8% efficient. You can see why supermassive black holes at the center of galaxies that are actively accreting matter, quasars, can shine with the energy that they do. The book also describes that two black holes that are spiraling in on each other will be going at one third the speed of light when they combine. The emission of gravitational waves is what saps the pair of rotational energy. Once the event horizon of the merged black holes settles down into the oval shape of a Kerr black hole, the emission of gravitational waves ceases. This settling process is called “ringdown”. We also discussed that Dean will kickoff his “Cosmos” class at our next meeting. We’ll watch the DVD segment and read the appropriate chapter in the book in preparation for our discussion. I’m exited to re-visit Carl Sagan’s topics and see how our knowledge has changed since 1980. Wow!, already 38 years ago. ESA’s BepoColumbo mission to Mercury should launch on an Ariane rocket in Oct. The probe will take 8 years to travel to the planet. Two asteroid missions should take their samples – Japan’s Hayabusa 2 will sample Ryugu in July and return a sample in Dec 2020 and NASA’s Osiris-Rex will sample Beanu in Oct and return its sample in Sep 2023. SpaceX is expected to launch the inaugural Falcon Heavy rocket and try to land all three core stages, two at Kennedy Space Center and one on a barge in the Atlantic. With its 27 engines this rocket will be the most powerful active rocket in the world and capable of lifting 53 metric tons to LEO. month delay to reconfigure ground systems to support the new longer and more capable second stage of the SLS Block 1B configuration. In this mode SLS’s lift capacity will increase from 70 metric tons to LEO to 105 metric tons. The second SLS launch is planned to be Block 1B so it can send the Europa Clipper probe to Jupiter’s moon. With the increase lift capacity the probe should be able to reach Jupiter in only two years without having to perform any time delaying planetary gravity assists. This PDF document shows hows NASA plan is divided into 5 phases: Phase 0 – solve exploration mission challenges using the ISS; Phase 1 – conduct missions in cislunar space and assemble the DSG and Deep Space Transport (DST, a craft capable of travelling to Mars); Phase 2 – complete the DST and conduct a cislunar verification mission of the DST; Phase 3 & 4 – conduct missions to orbit Mars and its moons and then to the surface of Mars. The missions for SLS are defined out to EM-11 in the 2030s. Going back to the moon was first announced at the meeting of the new Space Council (within the TMRO video view from the 22:00 minute mark to 28:45 is the most informative info on the return to the moon). Going back to the moon seems like a popular path. NASA has signed an agreement to cooperate with the Russians and Japan, Canada, and Europe are interested as well as 6 US companies, Bigelow Aerospace, Boeing, Lockheed Martin, Orbital ATK, Sierra Nevada and Nanoracks. 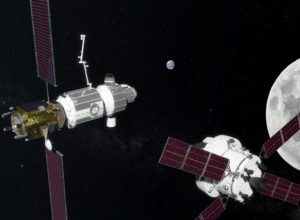 Lockheed Martin has released a video describing their vision for the craft to send to Mars called the Mars Base Camp which seems to be a variation on NASA’s DST. So far SLS is the only rocket I know that has its own rock song. A number by STYX titled “Gone, gone, gone”. NASA’s new asteroid missions, Lucy & Psyche – Here is a short video describing the missions. NASA chose Lucy (named after the pre-human fossil) to explore Trojan asteroids near Jupiter and Psyche to orbit a large metallic asteroid for the next Discovery class missions (low-cost, capped at $450 million planetary science like New Horizons probe). Lucy set for 2021 launch will take advantage of a unique orbital moment to fly past 6 of Jupiter’s Trojans which proceed and follow the gas giant in its orbit. After passing one asteroid in main belt in 2027, it will fly past 4 Trojans over 1.5 years. Then 5 years later it will pass a rare binary asteroid (Patroclus and Menoetius) in a highly tilted orbit from Jupiter’s plane. The binary might be pristine leftovers from planet formation era. Psyche launching in 2023 will orbit a rare iron/nickel asteroid of the same name which is believed to be stripped to the bare core of a larger planet. Research shows that it might have a ruminant magnetism that was thought to only occur on full-fledged planets but possibly radioactive aluminum might have heated the small body to melt it. 16 Psyche is 210 km in diameter. Signs of water or hydroxyl on surface which could make it a promising resource depot for future human exploration. It will arrive on target in 2030. There were 5 finalists for Discovery missions but NEOCam, a search for earth threatening objects, DAVINCI (Deep Atmosphere Venus Investigation of Noble gases, Chemistry and Imaging) was to plunge into Venus atmosphere for 63 minutes to study chemical and isotropic composition and VERITAS (Venus Emissivity, Radio Science, InSAR, Topography and Spectroscopy) a Venus orbiter that would map the planet with radar hunting for active volcanism, were rejected. NASA might have selected the asteroid missions because it has a Congressional mandate to identify 90% of mid-sized Near Earth Objects (NEOs) by 2020. That goal won’t be reached. The B612 organization once promised to launch a similar telescope to NEOCam called Sentinal but has backed away from the project. The LSST (Large Synoptic Survey Telescope) will provide similar capabilility in 2023 when it starts surveying the entire sky every 3 nights from the Earth’s surface. NASA’s Discovery program has the goal to launch a mission every 2-3 years. However it has been 5 years since the last launch and the next mission, Insight mission to Mars, has been delayed until 2018. Kepler publishes its 8th and final catalog with 10 new Earth-sized planets in the habitable zones of their stars – The latest catalog from the original mission which looked at a part of Cygnus for 4 years contains 219 exoplanet candidates bringing mission total to 4034 of which 2335 are confirmed. The catalog contains 10 earth-sized exoplanets in the habitable zone bringing the total to 50. Most earth-like is KOI 7711 which is only 30% wider than Earth and with an orbit a little greater than ours. Small exoplanets are splitting into 2 sizes: 1) super-Earths (<1.5 earth radius) and 2) mini-Neptunes (2-3.5 earth radius). Neptune is 17x Earth’s mass and 4x its diameter. Super-Earths (<1.5x earth’s radius) are rocky whereas mini Neptunes would be gaseous. S&T magazine says so far 700 super earths (5-10x earths mass & 1.2-2.5x earths radius) and 900 mini neptunes (<3x earth radius) have been discovered. Curiosity Rover reaches 5 year mark on Mars – Here is a great picture of it next to a dune. Here is the latest path of the rover. I still vividly remember the “7 minutes of terror” video of its landing on Mars. So far Curiosity has the record for mass landed on Mars at 900 kg or 1980 lbs so just under 1 metric ton or 1000 kg or 2200 lbs. Voyager space probes launched 40 years ago – PBS recently aired a 2 hour special called “The Farthest: Voyager in Space”. Voyager2 was first to launch on Aug 20, 1977 and Voyager 1 followed on Sep 5, 1977. The probes took advantage of an alignment that only happens once every 176 years to visit so many planets. The probes had the computing power of a car key fob. Both are still communicating. The Voyager Mission Status as of Dec 1 has Voyager 1 as the farthest at 13 billion miles (141 AU & 19h 35m light time) and Voyager 2 is at 11 billion miles (116 AU). Voyager 2 did the grand tour of Jupiter-Saturn-Uranus-Neptune. Voyager 1 sacrificed the grand tour to get a closer look at Saturn’s moon, Titan, and was flung out of the plane of the Solar System. The probes might last until 2030 with the current decay of their radio isotope electricity generators. They are traveling at 34,000+ mph. Voyager 1 was the first object to cross into interstellar region. They both contain “Golden Records” of sounds from Earth. Do we really think aliens know how to use a turntable to play a record? NASA already overbudget on their next space telescope WFIRST (Wide Field InfraRed Survey Telescope) – The telescrope is due to launch in the mid 2020’s and is projected to cost $3.6 billion which is 12% over budget. It is designed to investigate dark energy and exoplanets and is the top mission priority of the 2010 decadal survey. The mission’s mirror was enlarged to use a 2.4 meter mirror donated by National Reconnaissance Office in 2012 over the original design size of 1.5 meter. Also the complexity was increased when a coronagraph was added. A coronagraph masks the light from the central star so that the exoplanets can be studied. The probe will also will carry equipment compatible with “Starshade”, a spacecraft that would block the starlight from a distance. WFIRST has the sensitivity of Hubble but a field of view 100x the size of Hubble’s. rocket launches. SpaceX also uses pad 39A which launched the last space shuttle. SpaceX lands their first stages on SLC13. 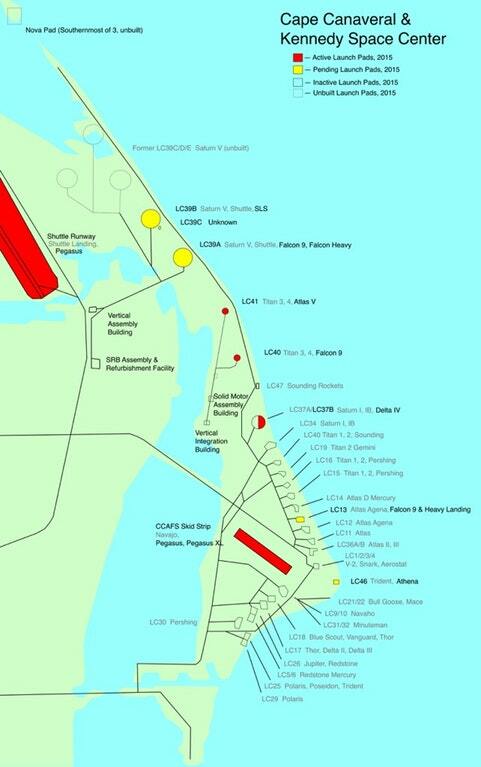 At left is a map showing the location of the launch pads at Kennedy Space Center (in yellow) and the Cape Canaveral Air Force Station (in red). NASA wants help in naming 2014 MU69 – New Horizons is to flyby 2014 MU69 on 1/1/2019. Some naming suggestions are Peanut, Almond and Cashew. Also Mjolnir (the hammer of the Norse god Thor) and Z’ha’dum a planet from Babylon 5 have been proposed. Multiple names might be needed if the object turns out to be a binary. Anyone can suggest a name but the SETI Institute must approve of the name before putting it on the ballot. So Planet McPlanetface is a long shot. Click on “hosting the contest” to vote. Voting closes on Dec 6th. My choices were Pharos (lighthouse of ancient Alexandria and its library) and Trantor (planetary home of Asimov’s Galactic Library). Andy Weir (of “The Martian” fame) has new book about the first city on the moon – The book takes place 115 years after Apollo 11 (that date is already approaching 50 years in the past) where tourists stay at a commercial lunar site near Tranquility Base. The plot is a tale of crime with a new protagonist, a 20 something named Jasmine Bashara (aka “Jazz”). The lunar city is called Artemis (also book’s name). It is described as a riveting space adventure grounded in science. Dreamchaser makes first successful autonomous landing – The test craft landed 11/11/17 at Edwards Air Force Base after being lifted to 12,000 feet and dropped from a helicopter. It reached a speed of 330 mph and landed at 191 mph. In 2013 Sierra Nevada did a similar drop but one of the landing gear didn’t deploy crashing the vehicle. DreamChaser uses a nose-mounted skid which efficiently utilizes storage volume in the nose by allowing direct mount of thermal protection tiles and eliminating need to maintain wheel tire pressure in orbit. NASA plans to have it carry cargo to the ISS beginning in 2020 with launches on the Atlas 5 rocket and landings at Kennedy Space Center. It is capable of landing at any commercial runway of 8000 feet. The cargo configuration of Dream Chaser is about 50 feet long compared to the Shuttle which was 120 feet long. Although NASA will use an unmanned DreamChaser, Germany and the United Nations both are planning to use DreamChaser to orbit up to 6 people. Oumuamua is the first detected interstellar visitor – ( pronounced oh MOO-uh Moo-uh) click on the 2nd picture of the object for a informative 3 minute video describing the object. It is a rocky cigar shaped asteroid with a reddish hue and is up to 400 meters (quarter mile) in length by 40 meters width. It exhibits a lot of variability in brightness due to its irregular shape. It’s traveling at 85,700 mph relative to the Sun and was discovered on Oct 19. On Sep 9 it made its closest approach to the Sun and reached its maximum speed of 196,000 mph. Scientists feel one interstellar object passes thru the solar system each year but they are very dim. Solar System have an amazing total of 172 moons (Jupiter 69, Saturn 62, Uranus 27 and Neptune 14). Cassini performed 293 orbits of Saturn in its 13 years at Saturn. It made some amazing orbit changes by using gravity assists from the moon Titan. Saturn’s rings are 175,000 miles across and only 30 feet thick. If you had a Saturn model a meter wide (3 feet), its rings would be 10,000 times thinner than a razor blade! Cassini also carried the Huygens probe that soft landed on Titan. 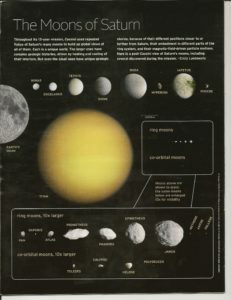 The moon is bigger than the planet Mercury and extremely cold at -290 degrees F. It is considered a possible location of life because it has an atmosphere 1.5 times the density of Earth’s and because it is the only other Solar System body with liquid at the surface (liquid methane and ethane). There is no danger that the methane will explode because the atmosphere has no oxygen being almost entirely made of nitrogen. Due to the light winds on Titan I’ve heard some scientists say we could exist on Titan without a space suit. All that would be needed was a good parka and an oxygen tank with a nose attachment. Because of the lower radiation environment around Saturn, scientists feel the tiny moon Enceladus (310 mile diameter) might be the best place for life in the Solar System. Cassini sampled the geysers that erupt from its surface and detected organic compounds indicating that the liquid ocean under the ice is in contact with hot rocks similar to the black smokers under Earth’s oceans. Cassini was beginning to run out of attitude control propellant. Rather than risk possible contamination of Titan or Enceladus, NASA decided to have the probe perform some ricky manuevers by flying between the planet and the inner rings. And finally it was sent into the atmosphere and burn up on Sep 15, 2017. Here is a good video that summarizes the mission. NASA has produced a 110 page PDF document, “The Saturn System -Through the Eyes of Cassini”. By chapter my favorites photos are, Chapter 1 – Saturn – Crown Jewel of the Solar System (p 14-15 north pole hexagon with central hurricane; p 18 intense storm on Saturn’s surface; p 20 Saturn in eclipse); Chapter 2 Rings: Ice Particles, Moonlets & Gravity (p24 ring detail; p35 Bleriot- a moonlet too small to see ( possibly 800 meter in size) causing a propeller in the rings; p 37 sawtooth shadows; p39 more shadows); Chapter 3 Titan – A Moon Obscured (p 50 & 53-54 lakes of methane; p 58 view of the surface); Chapter 4 Enceladus – Rarest of Pearls (p 63 tiger stripes; p 67 normal light picture, Enceladus has the brightest surface in Solar System; p 72 plumes; p 75 fissures); Chapter 5 Other Moons (p 87 Iapetus, the 2 tone moon; p 90 Prometheus; p 91 Dione; p 97 Hyperion, the sponge moon; p 99 Mimas, the death star moon). 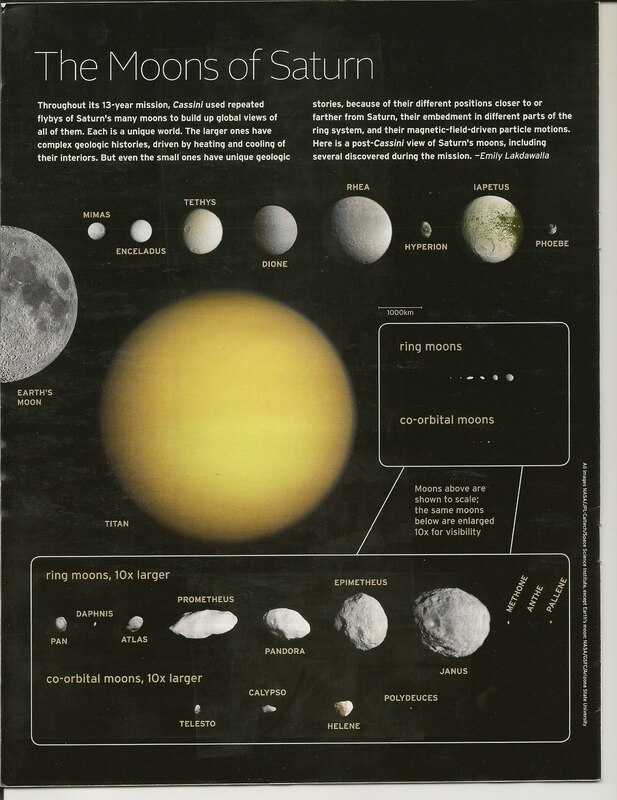 Not in the PDF book, this short video of the 21 miles diameter moon, Pan, shows it shapped like a piece of ravioli. The equatorial ridge is an accumulation of ring particles. It orbits within rings both inward and outward of its location.